Pavement Condition The next time you are standing next to a street, and at a safe location, please take a moment to look closely at the surface of the road. What do you see? You may notice that the surface or pavement is black or maybe gray. You may also see some cracks in the road. Some of the cracks may form a pattern that looks like the skin of an alligator. Other cracks may be few and far between. Some cracks may be wide, while other cracks are narrow. 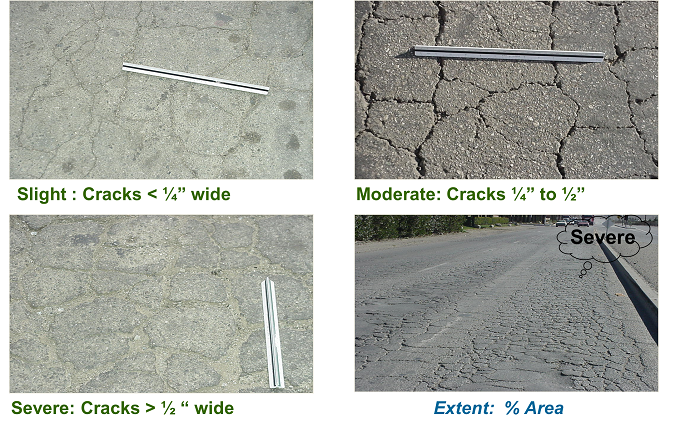 The patterns and frequency of these cracks or “pavement distresses” as they are commonly called are very helpful in rating the pavement condition of our roads. Our first step in determining the pavement condition of the road is to perform a pavement evaluation. A scale is used so that we can tell the relative condition of the road . The rating scale is called a Pavement Condition Index (PCI) and uses a 0 to 100 rating scale. A road in excellent condition gets a rating of 100 while a completely failed road would get a rating of 0. We also want to have our roads evaluated the same way so that these numbers will have the same meaning no matter where you are in the County. To ensure consistency in our ratings, our pavement evaluators follow specific guidelines outlined in our Pavement Management rating manual. Pavement Condition Index (PCI) After the pavement distress data is collected in the field the data is then entered into our Pavement Management System (PMS). Our PMS processes the data and calculates the PCI based on the 0 to 100 rating scale. The PCI is based on the type, severity, and extent of distresses that exists on a pavement. The severity of distress is based on the widths of the cracks. The extent of the distress is based on the affected area, linear length or linear spacing of the cracks. How does the PMS convert the pavement distresses to a PCI? Basically, the PCI is incrementally reduced from a rating of 100 based on type, severity, and extent of the distresses present. It’s very similar to taking a test where certain parts of the exam are weighted more than other parts (essay is worth more than the multiple choice questions) and if you get more wrong (more and wider cracks) the score goes down. We want to achieve high grades on our roads just like in school. Right Road So what does knowing the PCI have to do with the Right Road? The PCI indicates what is the current condition of the road. This information is very helpful to the pavement engineer and is the first step in coming up with a feasible treatment strategy. Right Treatment Roads that are severely distressed probably need a major overhaul requiring the road to be reconstructed. Typically these roads cost a lot of money to repair and often cause the most impact to the traveling public. Roads that are in good condition need a less involved treatment and are less costly and less disruptive to motorists. Selecting the Right Treatment is a function of many factors. In all cases, it is important to identity the real cause of failure in order to allow the simplest and cost effective treatment to be used to solve the problem. Right Time “Timing is everything” they say and it’s no different with treating roads. If you look at the life-cycle of a road you will see that as time goes on the road continues to deteriorate if left untreated. Of course pavement lifecycle curves vary depending on the traffic volume, thickness of the pavement layer, and strength of the soil beneath the pavement. The diagram below is a typical life-cycle curve of a pavement. The curve is fairly flat in the initial years of the pavement life-cycle curve (PCI stays near 100), then as it ages, the pavement declines to a poor condition after it has aged approximately 75% of its life (typically 20 years). As shown on the curve as the pavement condition worsens, the treatment changes resulting in higher treatment costs. If we time the treatments properly, especially when the road condition is in the upper 75% of the curve , we will have the opportunity to keep costs low and treat more roads. Right Way One of the most important elements of a successful project is that the pavement treatment is constructed the Right Way. We could select the Right Treatment for the Right Road and build it at the Right Time, but if the Right Treatment is not don’t constructed properly, the project’s success is diminished considerably. Poor workmanship can reduce the long term performance, and often results with community dissatisfaction. Not only are we disappointed that the project will not perform as designed, we are left with a road that looks horrible! To help avoid this from happening, our inspectors oversee the Contractors activities and we test the materials placed in construction.